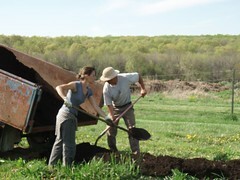 Compost is a critical component of our Organic Management System. We add compost to the soil to counterbalance the damage done to soil structure by tillage. Our observation of soil structure at North Slope Farm is that even soil with an organic matter content of 5%, regularly tilled soil does not have strong bonds. Our permanent raised beds have around 8% organic matter and they do show significantly improved soil structure despite regular tillage.